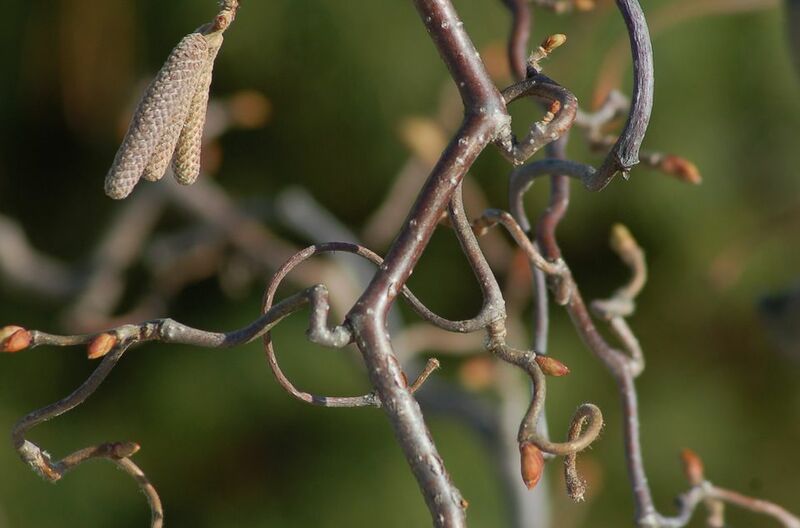 Coylus avellana 'Contorta' is a deciduous woody shrub with an appearance that is as unusual as its common name: Harry Lauder's walking stick. 'Contorta' is a sport—a naturally occurring variation of Coylus avellana, a shrub commonly known as the common hazel or European filbert. The 'Contorta' variation was discovered in the mid-1800s in Great Britain and was named for a Scottish vaudevillian entertainer, Harry Lauder, who used a crooked branch from the shrub as a walking cane. It's unusual appearance led to this variation being extensively propagated by grafting onto rootstock. Growing to a maximum height of 8 to 10 feet, the shrub is commonly used in hedge and screen borders where the interesting stems can be observed up close. The cut stems are frequently used in decorative arrangements. Technically a deciduous flowering shrub, the grafting process by which the 'Contorta' branches are joined to the donor tree at a height of about 4 feet means that it is often grown as a dwarf tree. Soil pH: 6.0 to 8.0; acid to alkaline. Plant this shrub in moist, well-drained soil rich in organic material; it does not tolerate dense clay soils. The shrub is normally planted from balled-and-burlapped specimens or potted plants in fall or spring. It grows well in full sun to part shade. Water quite frequently in the first few years after planting to help the shrub establish a strong root system; you can water less frequently once plants are mature. Remove root suckers as they appear, since these grow from the rootstock and will not have the contorted shape found on the grafted branches. Pruning is normally done to maximize the appearance of the interesting twisty branches; the foliage is bland. The catkins are nondescript in winter, but in spring they lengthen to 2 or 3 inches and become yellow. Winter and spring are the best seasons for this shrub. This plant offers no fall-foliage color of note. Plant Harry Lauder's walking stick shrubs in full sun to part shade. This shrub prefers well-drain loam rich in organic material and may struggle in dense clay soils. If the soil is not ideal, dig in organic amendments before planting. This is a shrub with very good tolerance for alkaline soils. This shrub needs about 1 inch of water per week during the growing season. Excessive water can cause the roots to rot, especially in soils that are dense. Frequent watering is more important when the shrubs are young. This sturdy hedge shrub tolerates a wide range of temperature extremes but may require extra water in very hot climates. Usually, this shrub requires no feeding, but if soil tests indicate a deficit, fertilize in late fall or early spring with a granular slow-release balanced fertilizer. As a grafted plant, Harry Lauder's walking stick is difficult to propagate. Neither the seeds nor the root suckers can be reproduced true to the original plant. Some people have success with soil layering, a somewhat difficult process. Recently, a new cultivar named 'Red Majestic' has been introduced. It has burgundy-colored new growth, which gives the shrub more summer appeal that traditional 'Contorta,' whose foliage is unattractive. Inspect the shrub monthly for suckers, which should be cut off. Trimming of the bush is usually done to enhance the visibility of the contorted, twisty branches, as well as to control the size of the shrub. Make each cut about 1/8 inch above a leaf bud, and make sure to make clean cuts without crushing the branches. Be judicious and conservative with trimming, as this is a slow-growing shrub that will require time to recover. To train the plant as a small tree, cut away the lower branches, leaving a central trunk. This shrub has good resistance to the filbert blight that can devastate other members of the genus. Occasional disease problems include black knot, crown gall, apple mosaic virus, and leaf spot. Affected branches should be removed and destroyed, but viruses, in particular, are very hard to treat. These problems can be minimized by using sterile tools when trimming, and by keeping the ground around the shrubs free of debris. Leaf spots can be treated with fungicides. Scale insects and Japanese beetles can attack the plant. To control the scale, spray with organic Neem oil at the first sign of their presence. Japanese beetles are easily picked off by hand and drowned in a can of soapy water.